How do you document an options Object? Here's an example of a badly designed constructor that doesn't take advantage of this feature - the final 5 arguments are all optional, but yet, location must be passed in if the developer wants to specify hobbies. So, most people are in agreement that this is a good technique, but there's one problem: there's no standard on how these options objects should be documented. 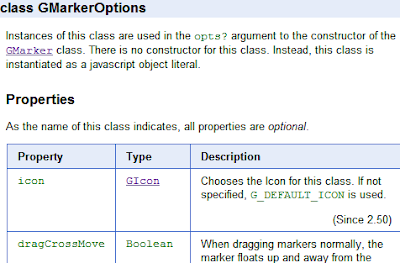 The screenshots below are from the GMarker and GMarkerOptions reference. 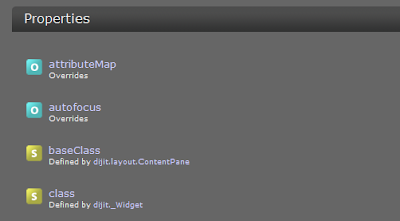 In the Maps API for Flash, we turned those name objects into actual classes that developers must instantiate. This is good for documentation, but does perhaps bloat our API and make constructors more verbose. The screenshots below are from the Marker and MarkerOptions reference. In jQuery UI, every widget gets its own single-page documentation, with "Options" being a section along with "Events" and "Methods". There is no actual reference for the widget constructor itself, presumably because every widget's constructor takes only an options object. This likely works for jQuery UI developers as they're accustomed to this convention, but I personally found it confusing that there was no constructor reference. The screenshots below are from the Dialog reference and options section. In Dojo API, the reference for many of the Dijits specify that they take an Object for additional parameters, but they don't actually make it clear what can be passed into that object. My best guess is that the fields listed in the "Properties" section can all be passed in. This is probably once again a convention that seasoned Dojo developers are accustomed to, but arguably pretty confusing for a new Dojo developer. The screenshots below are from the Dialog reference and the properties section. In the Gears API, none of the constructors take a options argument, but there is something somewhat analagous: objects passed into event callbacks. In this case, Gears documents the object entirely inline with the reference. This technique has the advantage that everything about the function and the object are in one place - and the disadvantage that there's not a great way of referring to that specific event callback object elsewhere (besides saying "the object that the onerror function passes back"). The screenshot below is from the WorkerPool reference. All of these styles have their pros and cons - and there's no one technique that satisfy our goals, like being easy for newbies to understand easy to refer to elsewhere in the documentation. What do you think? Have you seen a documentation that does it better, or do you think one of these techniques is clearly superior? I don't like documentation that pushes the options key:value descriptions into a new section of the docco. Perhaps this sort of behaviour extends from giving them "class names" like GMarkerOptions. Roman, I really like that style, thanks for the pointer.